You saved another 5% Off by subscribing! We started Paleovalley to make improving your health and nourishing your body with nutrient-rich snacks and superfoods simple and hassle-free. Right now we're offering savings over 30% off our new Pasture-Raised Turkey Sticks. Right now we're offering saving over 30% off our best-selling Grass Fed Organ Complex. We created Paleovalley Pasture-Raised Turkey Sticks to make healthy snacking easier. Our turkey sticks are made from turkeys who are allowed to live as nature intended... on organic grass pastures with plenty of sunshine, fresh air and room to exercise. The result of raising turkeys in such a natural way is a much healthier, clean protein with higher levels of vitamins, minerals, and omega-3s. Unfortunately, virtually all turkey in the USA is conventionally raised with a small portion being "free range" – a virtually meaningless term that simply means the turkeys were allowed access to the outdoors. However, most "free range" turkeys only have access to an outdoor dirt field with no pasture in sight. Our truly pasture-raised turkeys are given full access to outdoor, pesticide-free pasture with plenty of grass and insects for them to nibble on. WHY OUR TURKEY STICKS ARE BETTER? Our truly pasture-raised turkey is raised in the U.S.A. by family farmers focused on using rotational grazing practices and creating lush, green pastures free of chemicals and pesticides. We never use antibiotics, steroids, hormones or confinement crates! We use organic spices to give our turkey sticks a delicious, savory flavor. Most other products use conventional spices that have likely been sprayed with herbicides and/or pesticides. This is what truly sets our turkey sticks apart. We use old world methods of fermenting our sticks so they are shelf stable without the use of chemicals or questionable ingredients. Virtually all other similar snack stick products use GMO corn-based citric acid encapsulated in hydrogenated oils to process their products. Thanks to this fermentation process, each stick contains 1 billion probiotic CFUs! We love making healthy products... but even more we love making healthy products that taste delicious. Our turkey sticks are so delicious we actually guarantee that you'll love them... seriously! We created Paleovalley Pasture-Raised Turkey Sticks to make healthy snacking on clean, high-quality protein easy and delicious. Here's the part you'll love, especially if you understand the importance of eating nutrient-rich foods. Our Pasture-Raised Turkey Sticks are made with happy, healthy turkeys – none of this "cage free" or "free range" trickery here. Pasture-raised animals living a natural life are, not surprisingly, much healthier and contain higher levels of vitamins and minerals. They also have a much more favorable omega-3 to omega-6 fatty acid ratio which is important because when omega-6 levels are too high inflammation is often the result. With such high quality ingredients we didn't want to degrade the product in the processing. While most snack stick products contain a health-damaging ingredient called encapsulated citric acid, we naturally ferment our sticks which results in a delicious, shelf stable product with the presence of gut-friendly probiotics. Do you think the term "cage free" means the animals are allowed to roam freely as they wish in lush pastures with a pretty red barn nearby? Well that's exactly what huge food manufacturers want you to picture in your head. However, this couldn't be further from the truth. This term simply means that the chickens were not confined to cages. They are still typically confined indoors in very close quarters where they see no sunlight, have no fresh air, and cannot forage for insects or their natural diet. “Free range” is another deceptive term that simply means the animals were allowed "access" to the outdoors. However, in most cases the animals are still kept in large warehouses with one small door that leads to a dirt field with no grass or insects (the natural diet of a turkey). More often than not the animals have no idea the door exists and spend their entire lives indoors. This is the gold standard! Pasture-raised to poultry is the equivalent to 100% grass fed to cows. The animals are raised on pasture where they can root for insects, eat grass and seeds, get sunlight and exercise to their heart's content. Pasture-raised turkey (and chicken for that matter) can be very difficult to find but it is worth it if you care about your health and the health of the environment. Pasture-raised turkey – Never confined. Naturally fermented and contain gut-friendly probiotics! Given how difficult it is to find truly pasture-raised turkey and its superior nutritional makeup, plus the fact that we naturally ferment them, our Pasture-Raised Turkey Sticks have already been a huge hit with health enthusiasts, conscious eaters, busy moms, hungry dads, and kids everywhere. How many packs should I order? Each pack contains ten 1 oz sticks and we recommend taking advantage of our bulk discount pricing so you can save more today. And keep in mind, if you have kids there is a very good chance this will be their new favorite snack so order enough that you don't start a house war over turkey sticks! Also, when you order 4 packs or more you will receive FREE shipping and handling. What are the ingredients in each flavor? Original: Pasture-raised turkey, water, sea salt, organic dextrose from tapioca (used to initiate the fermentation process - little to none remains in the final product), organic Italian seasoning (organic oregano, organic marjoram, organic thyme, organic basil, organic rosemary, organic sage), organic onion powder, organic cinnamon, lactic acid starter culture from non-GMO beets, wrapped in a dye-free beef collagen casing. Cranberry Orange: Pasture-raised turkey, organic cranberries, water, sea salt, organic dextrose from tapioca (used to initiate the fermentation process - little to none remains in the final product), organic cranberry powder, organic orange peel powder, celery juice powder, organic sage, organic garlic, lactic acid starter culture from beets, wrapped in a dye-free beef collagen casing. Yes, on orders of 4 packs or more you will receive 100% FREE shipping and handling. Our Pasture-Raised Turkey Sticks are shelf-stable at room temperature for 6 months. They do not need to be refrigerated but will last even longer if you keep them refrigerated. They can be kept frozen for 1 year - simply leave at room temperature to thaw and enjoy! Do these contain any gluten, grains, corn, soy, dairy, or GMOs? No, these Pasture-Raised Turkey Sticks are free from GMOs, gluten, grains, corn, soy, and dairy. Our turkeys live on organic pastures and are able to eat grass and insects to their heart's content. Turkeys are omnivores NOT vegetarians so it is very important they are able to eat a balanced diet of forage and bugs. The turkeys are given a supplemental diet of locally grown, non-GMO grains. Unlike cows, turkeys are able to digest grains much better. However, we are working to see if we can move to a completely grain-free ecosystem with our farmers. 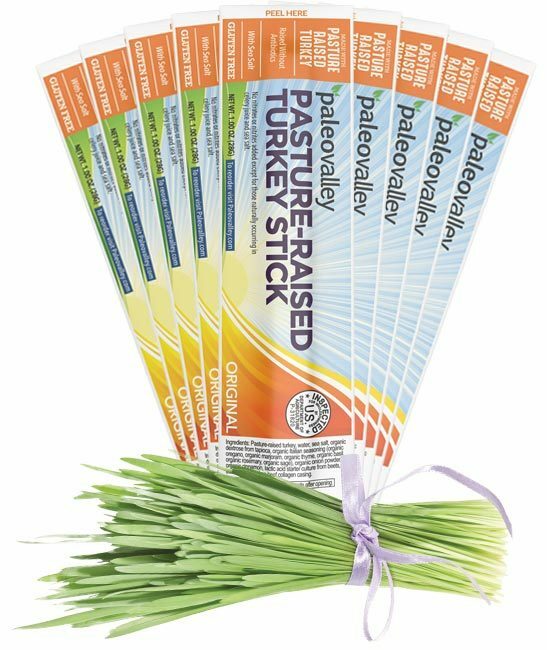 What makes Paleovalley Pasture-Raised Turkey Sticks better than other similar products? First off, we haven't found any other similar products. Ours are different for three main reasons. 1. Our turkey is actually pasture-raised while others can only claim "free-range" at best. The term "free-range" means little more than the turkeys have access to the outdoors but, in most cases, they actually see very little of the outdoors. On top of that, the outdoor access they have is typically nothing more than a concrete slab covered in dirt – there is no true pasture in sight. Our turkeys live on organic grass pastures full of grasses such as clover and alfalfa. They are also able to root for insects to complete their diet. 2. Organic spices. Other products typically cut corners and use conventional spices because they are much less expensive. Spices are some of the most beneficial and antioxidant-rich foods on the planet. We do not consider spraying them with pesticides and then irradiating them to be beneficial processes when it comes to your health. 3. No encapsulated citric acid. This is where our turkey sticks truly shine. Literally every other similar snack stick on the market (yes, even the so-called "healthy" ones) contains an ingredients called encapsulated citric acid. While this may sound innocent enough it is actually a very health damaging ingredient used for nothing more than preserving the product. It contain citric acid (sometimes lactic acid) typically derived from GMO corn which is then coated with hydrogenated oil – an ingredient known to cause massive amounts of inflammation. Instead of using this ingredient we use old world style, natural fermentation to preserve our sticks. The result is a delicious stick that is much juicier than others and, thanks to the fermentation process, the presence of gut-friendly probiotics. Is the organic dextrose used as a sweetener? We're glad you asked because we use organic dextrose for a very health conscious reason. First, our dextrose is derived from 100% organic cassava root (also known as tapioca). It is NOT used as a sweetener at all. We use a very small, trace amount (about 1/4th of 1 gram per stick) for the sole purpose of activating the fermentation process. By the end of the ferment there is little to no dextrose remaining in the stick as it has been consumed by the beneficial probiotic bacteria. Third party lab analysis has confirmed there are 0 grams of sugar from dextrose in our sticks. What if I don't like the taste after trying them? We don't want you to order anything that you aren't 100% happy with. Therefore, we have a 60 Day 100% money-back guarantee so if you aren't thrilled with your order just let us know and we'll refund you without any questions asked. Over 99% of our customers love our products so we're confident that you will too. No matter what you are covered by our 100% money back guarantee if you aren't completely satisfied with any of our products. our 100% Pasture-Raised Turkey Sticks, simply by subscribing!